Figure 1. This 1789 map by Joseph Purcell shows the “New State of Franklin” along with other southern states of the newly formed United States. 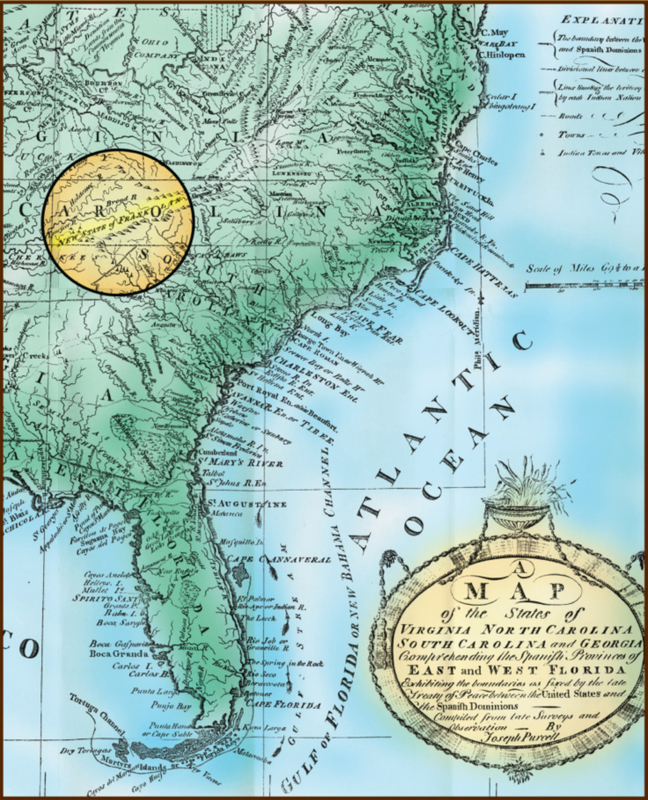 Purcell’s map was published by Jedidiah Morse in his The American Geography. Originally black and white, this map was given color courtesy of Natural Concepts. William Blount led a group of land speculators in the North Carolina General Assembly and helped pass the “Land Grab Act.” This opened North Carolina’s western lands (now Tennessee) up for sale. From late 1783 till the cession of the western lands by North Carolina in 1784, roughly four million acres of land was sold. April 23 – The United States Congress enacted the Ordinance of 1784. This law meant that western lands were to be ceded by the thirteen states to the national government, which would then be divided into ten districts from which new states would be formed. It was also decided that all new states would possess the same rights as the existing thirteen states. Spring – The North Carolina General Assembly held its spring session. In June, the assembly ceded its western lands (now Tennessee) to the United States Congress to help relieve the nation’s financial burden due to the Revolutionary War and in compliance with the Ordinance of 1784. North Carolina gave Congress one year to accept this cession bill. In the cession bill, North Carolina also declared that all land ceded and its inhabitants remained under their authority until Congress accepted the cession bill. August 23 – 24 – Delegates from Greene, Sullivan, and Washington Counties met in Jonesborough. Two men were elected from each captain’s company of the local militia to represent the three counties – Colonel John Tipton was not elected for this preliminary convention. The preliminary convention was called because the western people feared that Congress would not accept North Carolina’s cession of its western lands and that the North Carolina authorities would give little attention to its inhabitants. Believing that anarchy could occur and that Indian attacks and lawlessness would become common, the three counties met and unanimously declared their independence. October – November – North Carolina repealed its cession bill during the fall session of the General Assembly. Both the North Carolina House and Senate voted in favor of repealing the cession bill: House of Commons voted 37 to 22 in favor and Senate 19 to 11 in favor. North Carolina did not believe that some of the other states were ceding their western lands and making similar contributions to paying the national debt as they were. Therefore, they decided to retract their cession bill and keep their western lands. December 14 – Delegates of Greene, Sullivan, and Washington Counties met in Jonesborough. Both Colonel John and Joseph Tipton represented Washington County. This meeting became the State of Franklin’s First Constitutional Convention. During the convention, the delegates focused on preparing a temporary constitution that was to be reviewed again in six months to a year. The State of Franklin constitution was passed by a 28 to 15 vote. Colonel John and Joseph Tipton voted against the constitution. January 2 – John Sevier expressed in a letter his enthusiasm of being appointed to command the newly created Washington District, formed by North Carolina after the cession repeal of its western lands. This letter suggests that Sevier was not completely in favor of the formation of the State of Franklin at the beginning. Early January – John Sevier delivered a speech to the citizens of Jonesborough telling them of North Carolina’s repeal of the cession bill and conciliatory measures. Sometime after, Sevier addressed the people of Greene County about North Carolina’s repeal of the cession bill and urged them to go no further with establishing a new government. This, again, shows that Sevier was not fully in favor of the formation of the State of Franklin. Met in early March in Jonesborough and adjourned later that month. John Sevier was unanimously elected governor and he promptly accepted. Several acts were passed during the session, including the formation of several new counties – Spencer, Sevier, Caswell and Wayne. Major Samuel Henderson was sent by North Carolina Governor Alexander Martin to investigate the State of Franklin proceedings. John Sevier received a letter from Governor Martin via Henderson, whereupon he read the letter to the Assembly. On March 22, the Assembly replied to the letter and Sevier wrote a personal note along with the Assembly’s response to be delivered to Governor Martin via Henderson. The Assembly politely stated that the State of Franklin and its citizens wished to be separate from North Carolina. William Cocke was elected commissioner of the State of Franklin and was sent to appear before Congress to ask for admission to the Union. April 25 – North Carolina Governor Alexander Martin issued a Manifesto to the “revolting” State of Franklin. May 13 – Colonel John Tipton received copies of Governor Martin’s Manifesto: “I Received your Letter, with the manifesto, &c., by the hands of your messenger, and I think myself in duty bound to obey your Excellency’s Commands in all points required, both from the Zeal I bear the old State and the respect I bear toward your Excellency.” Colonel Tipton distributed the copies to others throughout the western lands of North Carolina. May 15 – Governor John Sevier countered the Manifesto with a State of Franklin Proclamation, which denounced Governor Martin’s Manifesto as a plot to disrupt peace and that the citizens wished to be separate from North Carolina. Governor Sevier and newly elected North Carolina Governor, Richard Caswell, corresponded with each other about the Manifesto. Sevier wrote Caswell on May 14 and Caswell responded on June 17. Sevier expressed his frustration with Martin’s Manifesto and Governor Caswell responded with a conciliatory manner and told Sevier that the Manifesto and all actions of North Carolina against the State of Franklin will be dropped until the next state assembly. May 15 – William Cocke arrived in New York where the United States Congress was in session at the time. May 16 – Cocke addressed Congress in an effort to win recognition for the State of Franklin. Congress denied recognition of the new state. May 31 till early June – Governor Sevier and a State of Franklin committee met with a committee of Cherokee chiefs and warriors to negotiate a peace treaty. The Dumplin Creek Treaty was signed by both parties on June 10. Not only did this treaty bring some peace between the State of Franklin and the Cherokees, but the Cherokees as well gave some of their lands to Franklin. Met in August in Jonesborough. Governor Sevier spoke of the recent peace treaty with the Cherokees. An act was passed to possibly explore down the Tennessee River. Blount County was formed in honor of William Blount. The Assembly called for a second constitutional convention to be held in November in Greeneville. Elected delegates of the counties of Franklin met on November 14 in Greeneville – Colonel John and Joseph Tipton represented Washington County. Samuel Houston’s “Frankland Constitution” was rejected and a similar constitution to North Carolina’s was adopted. Colonel John and Joseph Tipton and seventeen others protested and voted against it. During the convention, Greeneville became the permanent and only capitol of the State of Franklin. Shortly after the convention, Sevier and Tipton engaged in a verbal disagreement in the streets of Jonesborough. Sevier began beating Tipton over the head with a cane, while Tipton retaliated with his fists. The fight was stopped before any real violence could occur. On November 28, 1785 the Treaty of Hopewell was signed between the United States and the Cherokees (which included William Blount representing North Carolina). On April 17 the treaty was ratified by Congress. In the treaty, the United States government gave land to the Cherokees that encompassed present-day middle and parts of East Tennessee. Some of the land was part of the State of Franklin counties of Greene, Spencer, Blount, Caswell and Sevier.This action superseded the Dumplin Creek Treaty between the State of Franklin and the Cherokees of the previous year. With no formal treaty, hostilities intensified between the two. From July 31 to August 3, the Cherokees and a Franklin commission (headed by William Cocke) negotiated another peace treaty and signed the Treaty of Coyatee. March – The Franklin spring session was held in Greeneville. A state seal may have been adopted at this session. Joseph Martin wrote North Carolina Governor Richard Caswell on May 11 saying, “I am told they [Franklin] have a coat of arms of their own.” Also, William Cocke was again elected to represent Franklin before the United States Congress – he seems to not have went, but instead wrote Benjamin Franklin for advice and telling him of the state’s name in honor of him. Benjamin Franklin replied by saying that he believed the new state was called Frankland and that he wished the best for the new state’s outcome. August – Colonel John Tipton was elected to the North Carolina Senate to represent Washington County. Franklinites also tried to run in the North Carolina elections, but to no avail – no one dared running against Tipton. For Washington County, the Franklinites held their elections in Jonesborough, while the North Carolina elections were held near Sycamore Shoals. Fall – Governor John Sevier called for a special General Assembly session. In the special session, William Cocke and David Campbell were elected to attend the upcoming North Carolina Assembly. They were to negotiate Franklin’s separation from North Carolina. Campbell became ill before the start of the Assembly and instead of traveling he sent Governor Richard Caswell a letter for separation to be read in front of the Assembly. The North Carolina Assembly ignored and denied Franklin’s plea for independence. November – The North Carolina General Assembly held its fall session. Senator John Tipton was elected as Chairman of the Committee of Memorials and Grievances. During the session, Senator Tipton sought to punish Jonesborough for its action in the August elections. He tried to have the Washington County seat moved from the town, but his attempt was unsuccessful. North Carolina also created Hawkins County, which encompassed Franklin’s Spencer County – this was put in motion by Senator Tipton. In addition, Evan Shelby was appointed Brigadier General of the western counties for North Carolina, while John Tipton was appointed as Colonel of the North Carolina militia for Washington County. Courthouse wars occurred throughout this year between the Franklin and North Carolina courts of the western counties. One faction would steal the other’s court records and occasionally that faction would try and retrieve those stolen records. Colonel John Tipton participated in these courthouse wars. Early 1787 – North Carolina Governor Richard Caswell sent word, through his son Winston, to the western county commissioners of his proclamation ordering Franklinites off Cherokee hunting grounds that were protected by the state. February – Appointed as one of the court justices for Washington County, Colonel Tipton saw to it that the North Carolina court be opened at the home of William Davis, near present-day Johnson City. Also, other North Carolina courts opened in Sullivan and Hawkins Counties (but not Greene). March – The State of Franklin held its spring session in Greeneville. Any person attempting to perform any official act under North Carolina authority was subject to punishment. Governor John Sevier received the power to enlist and call out the Franklin militia at any time he pleased. Also, the mood of the session was one of bitter – in large part due to Colonel Tipton. They condemned him for “being the instigator of our unhappiness” and hung him in effigy. March 20 – Brigadier General Evan Shelby of North Carolina and Governor John Sevier met at a conference at the house of Samuel Smith in Sullivan County to seek a solution to the conflict between the supporters of Franklin and the North Carolina loyalists. Both agreed and signed a peace agreement. Not all agreed with the Shelby-Sevier peace agreement – especially William Cocke. Neither side consented to follow the peace agreement in the weeks that followed. April 27 – Brig. Gen. Shelby held a conference with his county colonels (John Tipton being Washington County’s and being present at this conference) on the state of growing hostilities with the Franklinites and the citizens loyal to North Carolina. They spoke of the fear of possible warfare between the two factions. May 4 – Brig. Gen. Shelby wrote North Carolina Governor Richard Caswell and requested one thousand North Carolina troops to help in case of open warfare with the Franklinites. Governor Caswell replied to Brig. Gen. Shelby on May 31 after receiving his troop request and after holding a special council of state. Governor Caswell told Shelby that he “may not answer your [Shelby’s] expectations.” Instead, he wanted no part in open conflict with the State of Franklin and maintained his policy of conciliation. May – The State of Franklin held an assembly in Greeneville to consider the final adoption of the constitution from November of 1785. The assembly officially adopted the constitution. During this assembly, William Cocke proposed that Franklinites campaign in the upcoming August North Carolina Assembly elections to try and gain separation that way. After a heated debate, it was decided to instead send delegates to speak at the North Carolina Assembly for separation. Early Summer – Colonel Tipton led a party of North Carolina loyalists to Jonesborough to steal Franklin court records. In retaliation, a Franklin force seized North Carolina court records for Washington County. Early August – The Franklinites held an assembly session. During this session, Evan Shelby (a North Carolina Brigadier General and loyalist) was appointed to succeed Governor John Sevier as Franklin’s governor. Sevier wrote Shelby of the news, but Shelby declined the offer. August – The North Carolina Assembly elections were held – all four western counties participated (Greene, Sullivan, Washington, and Hawkins). With no separation compromise outlook near, the Franklinites reverted back to William Cocke’s May proposal to campaign against North Carolina loyalists. For the Washington County Senate seat, Franklinite Landon Carter campaigned against Colonel Tipton – electoral irregularities prevented either to obtain the seat in November. Governor Sevier also campaigned, but was not elected. Two Franklinites campaigned unopposed in Greene County and were awarded election by default. The election suffered from many electoral irregularities, and threats of violence occurred at the polls in Sullivan, Washington, and Hawkins Counties. August – Colonel Tipton led a force to gain possession of some Franklin county court records in Hawkins County. Rumors arose that Colonel Tipton captured Governor Sevier and took him to North Carolina. As a result, about 200 Franklinites hurried to Colonel Tipton’s home. Before any violence occurred, the men found out that the rumor was baseless. October 29 – Evan Shelby resigned his Brigadier Generalship due to old age (he was 67 years old at the time). November – Georgia Governor George Mathews sent word to Governor John Sevier of the go ahead of joining forces and invading the Creek Indians. This idea had been formulated between Governor Sevier and former Georgia Governor Edward Telfair the year before. The State of Franklin was to raise a 1,500 man militia in support of Georgia. For their help, Franklin was to receive land around the Muscle Shoals area. On November 28, Governor Sevier formally called for the raising of the Franklin militia. Before the planned Indian campaign began, in February 1788, Governor Sevier received word that the campaign was abandoned due to the recent Georgia and Creek peace treaty. Late 1787 – A signed petition that called for the State of Franklin’s independence from North Carolina was sent to and read before the state’s general assembly. Two noteworthy signers of the petition were Archibald Roane (second governor of Tennessee) and Andrew Jackson (seventh president of the United States). The North Carolina Assembly ignored the petition. November – The North Carolina Assembly held its fall session. Colonel Tipton arrived at the Assembly believing he was taking the senate seat for Washington County, but he and Landon Carter were denied the seat due to irregularities from the August elections. Colonel Tipton decided to stay in North Carolina while the session continued without him. During the session, an act to repeal the repeal act of 1784 was narrowly passed through both houses. Significant protest over the act, however, caused it to be tabled. This would have given the State of Franklin its desired separation from North Carolina. January – After returning from the North Carolina Assembly, Colonel John Tipton headed a 200 man expedition into Jonesborough to seize the Franklin county court records. During the expedition Andrew Caldwell, the Franklin sheriff for Jonesborough, was captured and paroled upon the agreement of not participating in the conflict with North Carolina and Franklin any more. Early February – Jonathan Pugh, the North Carolina sheriff of Washington County, was ordered by the Washington County court for North Carolina to seize property from John Sevier for compensation for owed taxes. Pugh seized several of Sevier’s slaves and took them to Colonel Tipton’s home for safekeeping. Enraged by this action, Governor Sevier formed the Franklin militia in Greeneville and marched towards Colonel Tipton’s home. From February 27 – 29 Governor Sevier besieged Colonel Tipton’s cabin. On the 29th, a small skirmish ensued between the North Carolina loyalists or Tiptonites and the Franklinites – the Battle of the State of Franklin. March 1 – Governor Sevier’s term as the State of Franklin’s governor ended and nobody succeeded him. March 11 – Colonel Tipton called for Major Robert Love, who was commanding the North Carolina militia in Greasy Cove (present-day Unicoi County, Tennessee), to raise and bring his militia to his home. For the rest of the month, Colonel Tipton and Major Love patrolled throughout the land protecting North Carolina loyalists. March 17 – William Cocke issued orders to raise the local Franklin Spencer County militia against and in response to Colonel Tipton’s force. The orders went unheeded, and it is believed that many of the militia captains refused to follow Cocke’s orders. Spring and Summer – John Sevier led a force of Franklinites on several expeditions against the Cherokee and Creek Indians. The North Carolina militia of the western lands as well fought against these Indians during the spring and summer months. July through September – Talk between John Sevier and Diego de Gardoqui (Spanish minister to U.S. affaires) intensify. The talks were for a possible State of Franklin and Spanish alliance. No alliance was ever formulated. July – North Carolina Governor Samuel Johnston issued a warrant for John Sevier’s arrest on the charge of treason against the state. July – North Carolina called for a state convention to ratify the United States Constitution. Both Colonel John and Joseph Tipton were elected with others to represent Washington County in the convention. Colonel Tipton and others voted against favorable action and nothing was accomplished before the convention adjourned, which left ratification for a later convention. August – Colonel Tipton was elected to the North Carolina senate to represent Washington County. October – The Franklin General Assembly met and determined how to pay each Franklin official. For his time as governor, John Sevier was to be paid 1,000 deer skins. October 9 – John Sevier and a group of his men appear at a general store in Jonesborough seeking whiskey and rum. David Deaderick, the store’s owner, confronted Sevier by telling him that he has neither. Andrew Caldwell, former Franklinite sheriff, also confronted Sevier. During the exchange of words, Sevier drew his pistols while Caldwell tried to retrieve his. One of Sevier’s pistols accidentally discharged and wounded Richard Collier – believed to be one of his own men. After the incident occurred, Deaderick and Caldwell raced to Colonel Tipton’s home to tell him of the incident. Including Deaderick, Caldwell, and Major Robert Love, Colonel John Tipton formed a small party to search for and arrest Sevier. The small force searched throughout the night. On the morning of October 10, they discovered Sevier hiding at the house of Mrs. Brown. Colonel Tipton vehemently sought out Sevier, but he had already slipped out the back of the house. To his relief, Sevier was spotted and arrested by Major Love and not by the raging Tipton. Sevier was then thrown into the Jonesborough jail for the night and on October 11, Colonel Tipton had him put in irons and sent by guard to Morganton, North Carolina for trial. While waiting for trial in Morganton, some loyal men of Sevier’s – including some of his family – entered the town and helped him escape. The local sheriff, William Morrison, did not give chase to capture Sevier – this is most likely because he had fought at the Battle of Kings Mountain and regarded Sevier as a hero for leading troops during the same battle as he fought in. November – The North Carolina Assembly met for its fall session. Senator Tipton was part of a committee that considered “the inhabitants on the Western Waters.” In the committee, a bill was introduced that would pardon all Franklinites except John Sevier. Senator Tipton was the only one of the committee to support it. At one point during the debate of the bill, he charged at the speaker, James Roddy (representing Greene County), and seized him by the throat. A duel was narrowly avoided. Also during the session, a cession bill was introduced and seconded by Senator Tipton. The bill was under the title of ceding “west of the Cumberland Mountains.” This would have kept what is now East Tennessee under the authority of North Carolina. The bill was defeated and the issue of ceding the western lands was put off until the next session. Again, Senator Tipton and others voted against ratifying the United States Constitution. Also, Senator Tipton introduced a bill “to prevent vexatious [or harassing] lawsuits” in the western counties. This bill was rejected on the first reading. Early January – John Sevier fought against the Creek and Cherokee Indians under the pretence of the State of Franklin. January – With the dissolution of the State of Franklin, the people in Sevier County were left unprotected to possible Indian attacks. Therefore, the citizens in Sevier County and John Sevier authored the Articles of Association and sent it to North Carolina in hopes of being let in the union with North Carolina while maintaining their former Franklin officials and militia. North Carolina refused and the people were left to defend for themselves. February – John Sevier and some other Franklinites took an oath of allegiance to North Carolina in a Greene County court. August – John Sevier is elected to the North Carolina senate for Greene County. The North Carolina Assembly reviewed John Sevier’s conduct with the formation of the State of Franklin and decided that he “in such a manner as actually to prevent elections being held under the new government in two of the counties.” This alludes back to his 1785 Jonesborough speech in Washington County and his Greene County address to the citizens not to pursue any further action with the Franklin movement. During the session, Sevier voted in favor of ceding the western lands of North Carolina and of North Carolina’s ratification of the United States Constitution – both of these acts passed. The former led to the formation of the Southwest Territory and eventually Tennessee, while the latter led to North Carolina becoming the 12th state to join the Union by ratifying the U. S. Constitution. Walter Clark, ed., The State Records of North Carolina (Goldsboro, North Carolina: Nash Brothers, 1907), 22: 648. Samuel Cole Williams, The History of the Lost State of Franklin, Rev. ed. (1933; repr., Johnson City, Tennessee: The Overmountain Press, 1993), 102. Walter, ed., The State Records of North Carolina , 22: 716. William P. Palmer, ed., Calendar of Virginia State Papers and Other Manuscripts, January 1, 1785, to July 2, 1789 (Richmond: Public Printing, 1884), 4: 417. Williams, The History of the Lost State of Franklin, 247.